Step 1. Cook the rice as per packet instructions and lay out on a tray to cool or place in the fridge overnight. Step 2. Heat wok with half of the oil until smoking and add beaten eggs. Chop these with a flat spatula and scrape down the sides until you have very small pieces of scrambled egg. Step 3. Heat remaining oil in the wok until smoking and add Char sui. Toss until heated through. Step 4. Add rice to the wok and continue to turn and flip until heated through. Add soy sauce and combine well. Return the eggs to the pan and toss well. Add shallots and continue to fry for 1-2 minutes. Serve. This is quite an economical dish. It is traditionally made of leftovers and stretches far. You can quite easily double the recipe for a crowd. 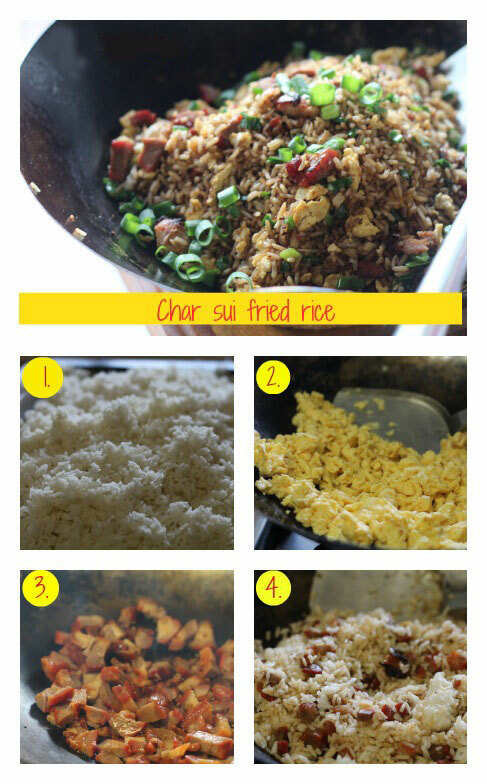 If you don’t have char sui you can use chopped barbecue chicken in its place.